I’ve read what you have about 700x25c tires. That they impart a legendary if not mythical improvement to ride quality. The Escherian paradox of a larger, heavier tire somehow being faster. Too fascinating to ignore. So as I casually wore out the mismatched 23c rubber on my Langster (circa 2007, when the Langster – in silver – still resembled what one would construe as a reasonably traditional-looking bicycle), I made a tactical investment in a pair of Michelin Pro 4 in the 25c sizeway. And awaited the day I would summon just enough motivation to change the tires over. 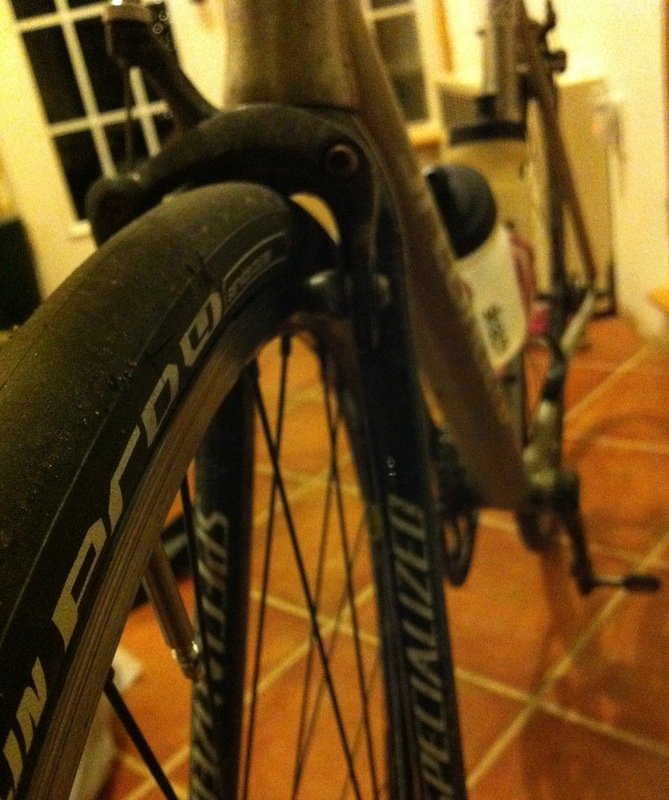 Which, given the state of filth of my wheels and the bike in general, looked to be some time off. And the existing tires, a fading Pro Race 3 with a negligible sidewall tear, the other an older Conti GP4k wearing quite well, still had love to give. I’d let them go a little longer. As I aired up in the moments before Saturday morning’s ride, the valve stem tore out of the rear tube, and the decision was made for me at that point. With minimal aggravation, the new tires were fitted, and I remarked at the visible upgrade in tire volume. Eager to know the untold comforts this would provide. Which I truly needed in this bike. I’ve spent a lot of time on it, always on 23c tires, as much as 90, 100 miles at a time. It’s a very snappy bike, but jarring. Unforgiving. As one might expect from an entry-level aluminum track frame. Conceived for the urban errand, not the long haul. Yet that is the perverse change of purpose I have subjected this thing to. It could use some measure of compliance. And Pro 4s, with their competitive weight, I’m hedging on the best of both worlds. Ironing out my rolling resistance, while preserving the solid, nearly telekinetic acceleration I’ve always loved in this bike. You knew it almost immediately. This new conformity to the pavement was obvious. But the handling was dull. They felt slow. Slow-er. My frisky whip had been mellowed out in a way I wanted, but I didn’t, but now I had, and now it is, ashes to ashes, dust to dust. Interestingly, as I suffered and heaved my way up an awful extended grade that morning, I could truly feel the tires rolling underneath. Smoothly. Round and smooth. Urging themselves forward. And in this particular circumstance, not particularly slow? So strange. A kind of perspective you really can only appreciate whilst making cadence in the 30s with a 46×18 gear up a double-digit grade. There’s a lot of time on your hands, in the silence between deafening lung inflations, to consider any particular facet of reality and that happened to be what I cued in on. Wow these roll nice. It is a really great job. I have read all the summary you have written, and I have found them very clear, interesting and easy for me to undersrand.I am really grateful for that.Many many thanks.